BioMAX septic tank products clean and maintain your septic tank, grease trap and leach field over 3 times as effectively as the leading X brand! 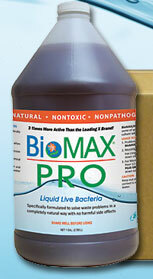 Using all natural, 100% safe and non-toxic live bacteria, BioMAX septic treatment products will establish an active bacteria population that keeps septic tanks and septic tank drain field lines free-flowing and odor free. 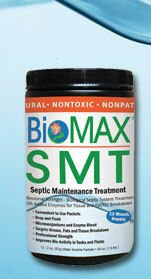 BioMAX septic tank products go to work on contact to degrade solids in septic tank and build-up in drain field lines. The unique blend includes bacteria specially formulated to break up grease. BioMAX septic tank maintenance products are formulated to solve waste problems in a completely natural way with no harmful side effects. Your septic tank and wastewater system relies on microorganisms to breakdown, degrade and remove organic matter. Unfortunately some slow-to-degrade organics, household chemicals, sanitizers and medication can deplete or kill the essential microorganisms within your wastewater system. Should this happen, organic matter will build up at a rate greater than the natural biological removal of system microorganisms, resulting in potential septic tank and system failure. 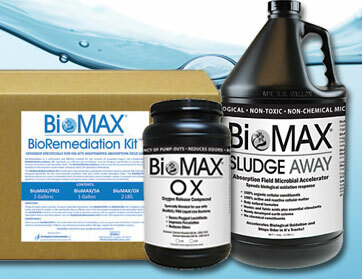 BioMAX septic tank cleaning and maintenance products are designed specifically to provide continued high rate microbial activity (when used on a regular basis), assuring long term system degradation performance. BioMAX septic tank products provide the best insurance money can buy for your septic system!